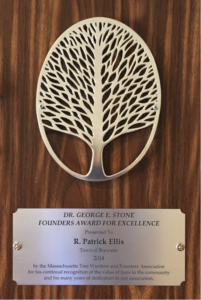 George E. Stone Award | Massachusetts Tree Wardens and Foresters Assn. 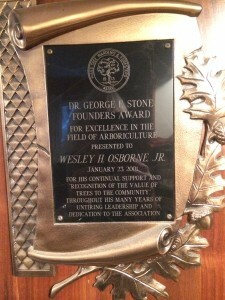 The Dr. George E. Stone Award is the association’s highest honor. 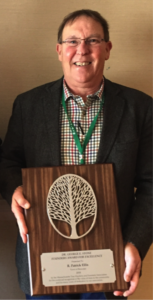 The award recognizes a person or organization that has continually demonstrated a strong commitment to the industry, significant advocacy on behalf of public trees, and dedicated volunteer servic e to the organization. Previous recipients have included members, non-members and organizations, all of them elected to receive this prestigious honor because of their willingness to support and lend a helping hand to the association. The award is presented at the annual meeting at the January conference. Recognition of the individual is also featured in the quarterly newsletter, The Bark, and on the association’s web page. A press release is shared with the town hall and local paper where the individual resides. The award is not necessarily presented every year. A minimum of ten years of service in the public tree sector.